In a ‘beautiful setting’, beside the Saxon church in a ‘picturesque’ North Pennines village, Cheryl and Thomas Robinson’s 18th-century inn is ‘an absolute gem’. ‘Wonderful. Ten out of ten,’ writes a delighted reader in 2018, of this Victorian retreat. ‘The Wood family continues to run this little hotel like a vocation,’ say readers this year, having visited regularly for over three decades. ‘Excellent standards are being maintained,’ confirms a Guide trusty this year, after staying at this village inn with rooms overlooking the Vale of Mowbray. After more than two decades, Frances and Bill Atkins have sold their cherished, creeper-covered 18th-century stone coaching inn overlooking the green in a Dales village – but fans should take heart. We have readers who return year after year to this ‘delightful, comfortable’ B&B with panoramic views across the North Yorkshire countryside. Heather and David Armstrong are warm and accommodating hosts at this ‘fascinating’ hotel, occupying a farmhouse and rustic-looking, purpose-built annexes. ‘Silver, copper, glass, china, pictures, rugs’ and other treasures are ‘trustingly displayed’ at Tim Culkin and Austin Lynch’s ‘wonderfully eccentric B&B’ just off the town square. 'Just outside a picturesque little village’, host to an annual gooseberry show, in the North York Moors national park, this ‘high-quality B&B’ is run by owners Georgina and Michael Curnow. Regular Guide readers laud Jeff and Jill Sutheran’s B&B, forged from a ‘delightfully converted’ Presbyterian church, as ‘a perfect base for exploring this beautiful part of the north-east’. Dee and Richard Slade’s hybrid of pub and hotel in the empty reaches of Northumberland again reached for the stars with its unique blend of sustainable hospitality and astronomy. Developments are afoot at this hotel, centred on a Georgian coach house, ‘in a glorious setting on a huge estate with beautiful walled garden’. A unique, centuries-old working waterwheel helps generate business for Jane and Neil McNair’s ‘warm and welcoming’ guest house in the Yorkshire Dales national park. Opposite Red Beck, the stream that once powered its machinery, this former mill draws visitors to the wooded Shibden valley. International joie de vivre is found in well-travelled Charlotte and David Reilly’s revamped former Victorian school and headmaster’s house. An ideal base for exploring James Herriot country, Robert and Sheila Mitchell’s ‘relaxing, welcoming’ B&B offers great walking and cycling routes, straight from the door – and ‘splendid’ facilities for wet or muddy kit. ‘Just perfect,’ says readers this year of Kathryn and Stuart Dobson’s large Victorian manor house in the heart of Weardale. A Georgian gentleman’s residence and next-door Carolean town house combine as one hotel on cobbled Frenchgate. A ‘lovely drive over moors’ leads to this hotel in a North Pennines village built from the stone of a dissolved 12th-century abbey. ‘In a quiet part of the village, overlooking the duck pond,’ Jacquie Pern and Peter Neville’s ‘very comfortable hotel’ finds favour with trusted readers. The Buchanan family has run this ‘heart-warming’ hotel for two generations, but, bar two short breaks, it has been a local hostelry since the 16th century. ‘Wow, what a wonderful place this is!’ A regular reader lauded Andrew Pern’s restaurant-with-rooms on the edge of the North York Moors, which has a Michelin star and ambience on tap. Guests step straight into a ‘grand entrance hall’ at this B&B in a village in the Yorkshire Dales national park. St Mary’s ‘stunning spire’ rises like Jack’s beanstalk – a heavenly marker of the approach to James and Kate Mackenzie’s ‘sublime’ pub-with-rooms. 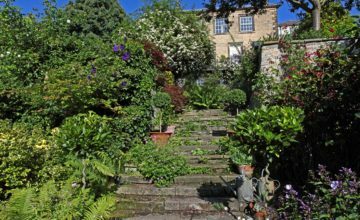 ‘Informal and friendly’, Jane Ratcliffe’s ‘utterly peaceful’ B&B stands on a hillside overlooking rolling Yorkshire countryside. ‘The tranquillity is very appealing’ at the Stainsby family’s 18th-century coaching inn-turned-gastropub in a hamlet on the slopes of the Washburn valley. Two miles outside Scarborough in the North York Moors National Park, a dog-friendly country house hotel set in seventeen acres of gardens and grounds. Individually designed bedrooms and suites are in the main house, or set around a wisteria-clad courtyard; some have direct access to the garden. The traditional, stone-walled bar has comfortable seating by a cheerful wood-burning stove, and there is a choice of dining – traditional Yorkshire gastro pub fare in the Bistro, or more creative cuisine in the Courtyard restaurant.